General Electric CEO Jeffrey Immelt calls clean energy "one of the best export stories the U.S. has today" and says businesses should participate in setting clean-energy policy to avoid getting left behind. Federal climate-change laws are on the horizon for the United States, General Electric CEO Jeffrey Immelt told conference attendees. "I'm not an environmentalist, but this is going to happen," he said at The Wall Street Journal ECO:nomics conference in Santa Barbara, Calif., on Wednesday evening, adding that costs already are going up and the business community has an opportunity to guide the changes rather than have reforms forced upon it. "Don't stick your head in the sand," he said. Immelt called clean energy "one of the best export stories the U.S. has today" and a major economic opportunity. But with about a dozen states that already have enacted their own cap-and-trade systems and other policies varying from state to state, consistency is needed, he said. "Where we are today, I'd argue, is the world of all worlds," he said, adding that the United States needs to establish a price for carbon so people can figure out the best way to reduce their costs. "We've got to get ahead of this." Responding to a question about the industry's reliance on subsidies, Immelt said the government has its hand in almost every industry, including the housing market, and it's clear the country needs new energy policies. "It's 2008. What do we like best about our energy policy?" he asked, to laughter and a smattering of applause. "Let's make a list." 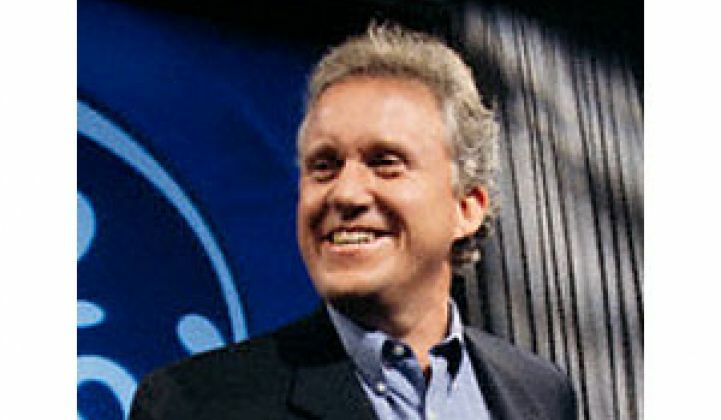 Immelt also said he doesn't need to be lectured on how to run a successful business, but came to the conference because "this is not going away." "I have sat here and seen the Clean Air Act, the Clean Water Act, and the day after they happen, all the people who talked about them go away," he said. "All the people who lobbied about them go away. And business is left to with it. And I'd rather have a seat at the table."